Old Hotel Brownies were adapted from a Palmer House Brownies recipe in the March 2009 issue of BA. The version I made a few weeks ago had a great texture, and I liked the flavor of the apricot preserves brushed over the nuts, but my batch seemed a little too sweet. I think it was because I used semisweet chocolate chips rather than a higher % cacao bittersweet chocolate. I wanted to try these again with a higher % cacao chocolate, but all I had was 60% so I mixed that with some unsweetened and had great results. Like the previous batch, these came out of the oven grainy and horrible looking. I had to resist the urge to throw them in the garbage; but after the brownies cooled and chilled, they were excellent. I think these will be even better tomorrow. Also, if you don’t have both kinds of chocolate but you do have 70% cacao or above, you could try using 9 oz of that. The version in the magazine did not call for any unsweetened. As promised, here is the photo. This was taken after the brownies chilled for several hours. Preheat oven to 350 degrees F. Line an 8 inch square metal pan with non-stick foil or line with foil and spray foil with cooking spray. Stir together cake flour, baking powder and salt; set aside. Melt butter in a saucepan set over medium heat. Add chocolate. Reduce heat to low and stir until chocolate is melted. Remove from heat and let cool slightly. Beat eggs and sugar together for about 40 seconds in a mixing bowl using high speed of an electric mixer. Stir or whisk in the melted chocolate and vanilla. Sprinkle the flour mixture over the chocolate batter and gently fold it in. Pour batter into prepared pan. Drop the pan from about 5 inches off the counter to release air bubbles. Chop the nuts and sprinkle them over the brownies. Bake brownies for 40-45 minutes or until edges are raised and have begun to pull away from pan. Microwave apricot preserves for 20 seconds and strain out any chunks (I didn’t strain). Brush as much as you like over nuts. Cool at room temperature for an hour then transfer to refrigerator to chill. Lift from pan and cut into 16 squares. Note about nuts: I used 1 cup of nuts. Louise made these with 2 cups of nuts and said the extra nuts, which were in the original recipe, really helped cut the sweetness of the brownie. So this brownie is probably better with the 2 cups of nuts. So I made these brownies today – yum! They really are delicious. I halved the recipe and used toasted walnuts. I did have one faux pas. I used a white glass casserole 8×8 baking dish, no parchment paper or foil at 40 minutes, and the bottomes burned a little. They have a nice crunch to them, but it seems to me these are supposed to be fudgey. Excellent recipe nonetheless! I’m glad you tried the Palmer House rather than just go with Ina’s recipe. I needed a second opinion. I made the Palmer House twice and both times found them to be good, but VERY fudgy. I’m glad you added the extra nuts too — they seem to be critical to the recipe so we can note that they cut the sweetness. It’s just a lot of nuts. I found I made modified Ina’s Outrageous Brownies just a couple weeks ago in the form of Oreo Brownies, so Palmer House Brownies were chosen after all. Plus, the ingredients were already on the kitchen counter. I used 2 4-oz. bars of Nestle’s 62% bittersweet and 1 oz. Scharffen Berger 99%. I used 2 cups of untoasted walnuts as per the original recipe. Definitely very fudgy brownies. I think the extra cup of walnuts is a good thing as it cuts the overall sweetness. I just had another one, after breakfast :-), and I can see why they’ve been popular for over a hundred years. The apricot glaze reminds me of Sacher Torte. These are fudgier than Ina’s. Honestly, I think I prefer Ina’s. Those look amazing, Anna! My all-time favorite brownie recipe is Ina Garten’s Outrageous Brownies with walnuts, but I might have to give these a try! Are they as fudgy-wudgy as they look? Thanks for the post! The look YUM-MEEE! Love the nuts. Yum, Anna! These brownies look totally fudgy and fabulous. I’m sorry I have yet to respond to yours and Katrina’s emails. I’m so excited to be on the receiving end–I loved the cookies you all came up with using the hard boiled egg, so it feels super special to be getting emails from you guys. I’ve been in class ALL day, and am actually in class now (but it’s super boring). I can’t wait to write back when I get home! LOL, still laughing over the slap your grandma rich comment….I wish it were that easy! Thanks, these sound really good. “slap-your-grandma”? I haven’t heard that one. 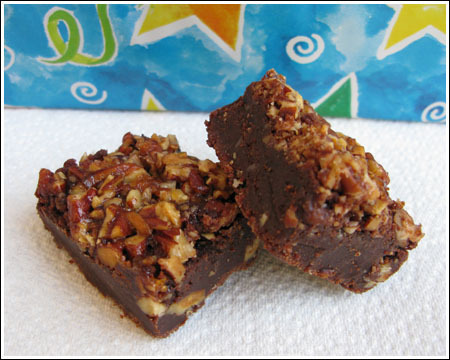 Way to use alternates and create a yummy brownies, well, you are the pro at that! WOW decedent and rich!! Incredible ! !